Recipe from "Jell-O Brand Collection", one of the many Amazon books I own. POUR milk into medium bowl. Add pudding mix. Beat with wire whisk for 2 minutes. Spoon into cups. Insert wooden popsicle stick into each to serve as handle. FREEZE five hours or overnight until firm. To remove pop from cup, place bottom of cup under warm running water for 15 seconds. Press firmly on bottom of cup to release pop. Do not twist or pull pop stick. Use Jell-O Chocolate flavored pudding and pie filling and add 1/2 cup mini marshmallows and 1/4 cup EACH semi-sweet chocolate chips and chopped peanuts. 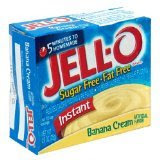 Use Jell-O Vanila Flavored pudding and pie filling and stir in 1/2 cup chocolate-covered toffee bars. Use Jell-O Vanila Flavored pudding and pie filling and stir in 1/2 cup chopped chocolate sandwich cookies. Use Jell-O Vanila Flavored pudding and pie filling and stir in 1/2 cup mocha-flavored chocolate chips.